Iron ore auctions in the country are losing their momentum, dogged by issues ranging from regulatory to environment and threat posed by the outlawed ultras. Since the enactment of the new Mines and Minerals Development & Regulation (MMDR) Act 2015, only 17 iron ore blocks could be auctioned. 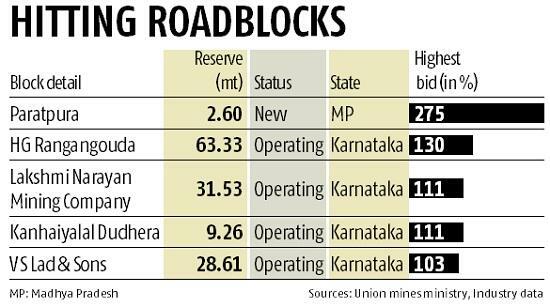 The list of auctioned deposits include 12 operative blocks offered for bidding in Karnataka. Auctions in the southern state were done conforming to a Supreme Court order pronounced before the revised MMDR Act was enforced. The price of acquiring these auctioned assets was deterring, an industry source said, citing that eight of the 17 blocks received final bids with a staggering premium of over 100 per cent, the highest being 275 per cent of the sale price notified by the Indian Bureau of Mines (IBM). Besides Karnataka, three iron ore blocks have been auctioned in Odisha and one apiece in Jharkhand and Madhya Pradesh. The other sore point is the disproportionate asset distribution in the auctioned blocks. Out of 17 blocks, six have deposits of less than 15 million tonnes and even for these blocks, mining leases are envisaged to be signed for 50 years as per statutory terms. Insufficient reserves in the six auctioned blocks have flagged concerns on long-term raw material security for meeting the requirement of end use projects. 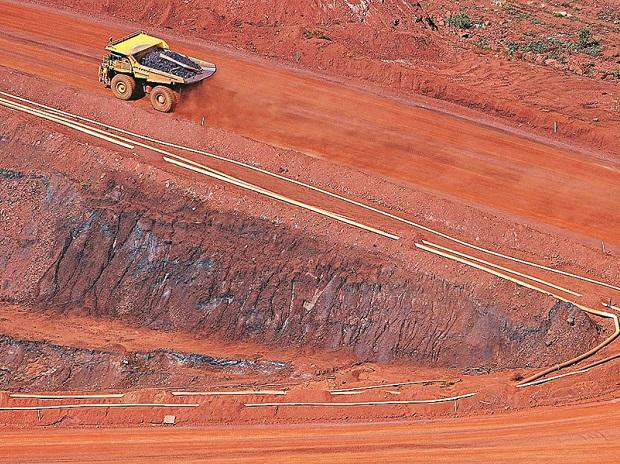 The future of iron ore blocks is beset with uncertainty. Key iron ore-producing states of Odisha, Jharkhand and Chhattisgarh are riddled with disparate roadblocks to the smooth conduct of auctions. In Odisha, not a single iron ore or any other mineral asset could be auctioned this fiscal, as the state government awaits clarity on maximum leasehold area that can be held by a lessee. The case is currently sub judice with the Delhi High Court. A petitioner in May 2018 had contested the Odisha government's move to permit a company to partake in auctions as it held around 50 sq kms of mining lease area in the state- this flouted the permissible rule of 10 sq km, the most that can be held to bid for a new block. The High Court stalled auctions of two iron ore blocks, Chandiposhi and Purheibahal, which drew 17 companies during online bidding. Notably, the state government had urged the Central government, in March last year, to revise the mine lease area cap to 75 sq km to overcome the constraining clause. In Chhattisgarh, iron ore auctions are yet to see the light of the day. Most of the state's iron ore resources are concentrated in Dantewada, Bijapur and Narayanpur districts acutely hit by Naxal extremism. Exploration work on the blocks has suffered because of the threat from Red rebels. Jharkhand, despite endowed with 4.6 billion tonnes that account for 16 per cent share in the country's iron ore deposits, is confronting environmental hurdles. Iron ore is heavily clustered in West Singhbhum district split into four forest divisions -- Saranda, Kolhat, Porhat and Chaibasa. Saranda forest region has been exposed to different ecological and carrying capacity studies since 2010-11. The heavily forested zone is home to species of endangered flying lizards and is also an integral part of the elephant corridor. A study by the Union environment ministry established a 21 per cent drop in elephant population between 2010 and 2016. The shrinkage in pachyderm count was ascribed largely to mining activities. This led to large tracts of forest land in Jharkhand classified as no-go area. Jharkhand currently faces production cap of 66 million tonnes in iron ore. The limits can be raised to 100 million tonnes if infrastructure is ramped up in and around the mines.